As a senior majoring in Visual Arts, having the opportunity to become an intern at the Gregg Museum for the semester was an amazing experience because it allowed me to see behind the scenes of the museum and to learn what it takes to produce incredible shows and exhibitions within the art world. It also enabled me the chance to specifically work with the Pre-Industrial World Textiles class and their use of the Gregg’s permanent collection to learn about the history of textiles around the world. Over the course of the semester I have seen well over a hundred textiles, but one in particular caught my attention so much that I had to take a picture of it. 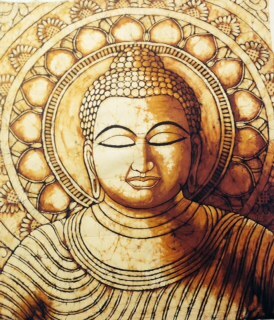 This is an Indonesian batik fabric depicting an image of the Buddha. Dating back as far as 2000 years ago, batik fabric has been found in the Far East, Middle East, Central Asia and India, but it is Indonesia in particular that has been the most successful with its production and popularity. Its islands, Java & Bali, contain all of the raw materials necessary, cotton, beeswax and many plants from which the dyes can be made, to order to produce the fabric. Similar in tradition to the styles and designs of Japanese society, the design an individual wore symbolized who they were and who they were associated with. There were a few that only the royal family could wear. The designs also changed according to the area in which the creator lived, as a coastal design would differ from one that was more inland. It is the way in which the wax is applied to the fabric that determines the design, and there are two methods in which these can be done: one carried out by women and the other by men. With the first the cloth is hung over the frame and then a canting tool (a small copper cupped spout) is used to slowly and smoothly pour the hot wax on to the fabric in intricate patterns. In the second, the fabric is stretched out on a long table and a stamping tool is used to transfer the wax in a more replicable manner. Once the wax is applied, dyes can be used to further the design, traditionally in deep indigo blues and soga browns. These fabrics are extremely labor intensive and can take months to complete. This particular Batik fabric was created rather recently but still utilizes tradition in its creation. By adding the image of the Buddha instead of the usual floral and organic shapes it brings to light the Buddhist culture of this technique’s place of origin. Having studied cultures and societies from every aspect of the world over the last four years and to not have come across this just highlights that I still have so much to learn and discover. Working at the Gregg was definitely an enlightening experience! Follow the Gregg on Twitter! Gregg Museum of Art & Design · A collecting museum at N.C. State University in Raleigh, NC. The collection includes, but is not limited to, textiles, ceramics, outsider/folk art, photography, architectural drawings & modern furniture.